Order by May 2, noon for Mother's Day delivery. 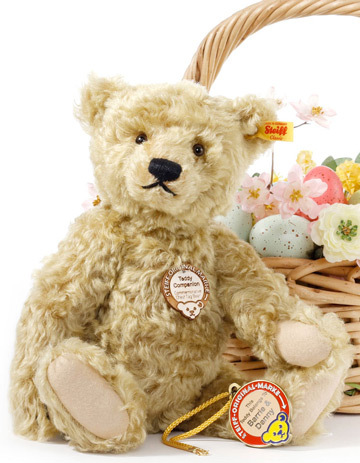 In 1902, Steiff created the 55PB, a mohair plush bear that is the basis for the modern Teddy Bear we know today. Over the ensuing years, Steiff refined their designs and in 1920 they created The Classic 1920 Teddy Bear, a Teddy that many regard as the pinnacle of Steiff's design and charm, which has been a favorite ever since. 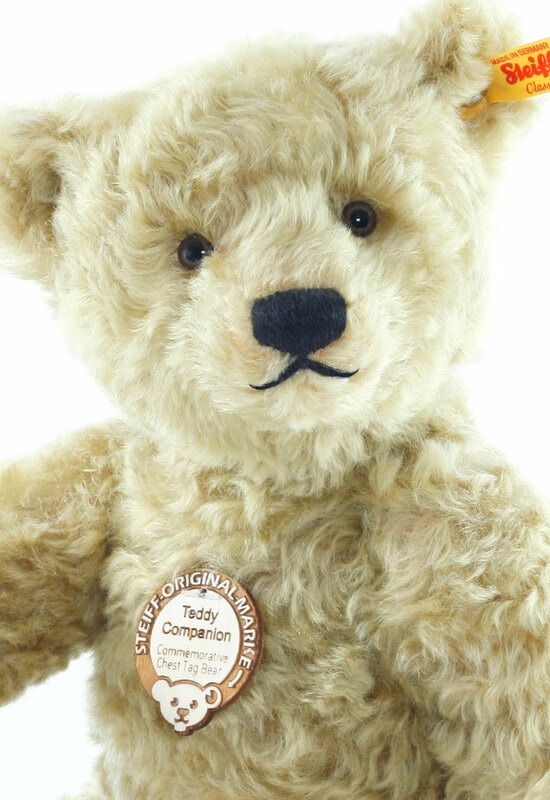 Teddy Companion is a wonderful replica of this delightful bear. His inviting face is traditional, yet incredibly friendly and appealing. He combines all the qualities Steiff is known for in one spectacular bear. Now, we are pleased to offer this classic 1920s Teddy with his own personalized medallion. Teddy Companion is made in true Steiff tradition with Schulte mohair, all-wool felt pad pads and an unforgettable expression. Such a sweet face that will draw you in with soulful eyes and a hand-stitched nose. Measuring 13.8 inches, he is five-way jointed and complements our yellow Commemorative Chest Tag Bear, Teddy, perfectly. Give him a tip back and forth and his growler will sound out. He has many stories from days long ago to share with you. Our new Teddy Companion is an extraordinary addition to an already exceptional family. With the warmth of his brassy Schulte mohair, he hearkens back to traditional bears of yesteryear. He is the perfect size to hold and hug and has a long, rich voice. He's wonderful! The bear head chest tag was used by Steiff from the 1920s to the 1970s, a truly amazing period in the history of Steiff. This paper tag with its bright, cheerful design is etched in the minds of those of us who grew up with Steiff. The bright colors in the design evoked fun and playfulness. In the center, the paper tag provided our friends' name. The arrow around the outside of the red circle reminded our parents to always look for the Steiff 'MARKE', meaning of course, the world famous 'Button-In-Ear' tag. 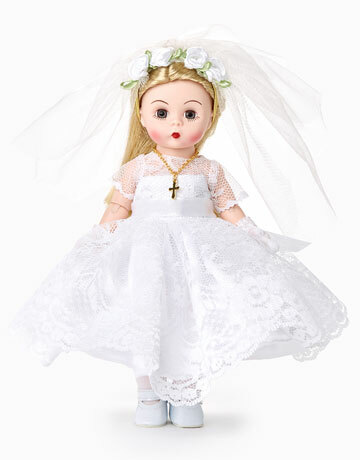 This became a reassuring symbol of a quality-made toy for their child. Spanning almost half a century, the bear head became an immediately recognized symbol of friendship and fun to children everywhere. The original design featured a more realistic bear head. This was modified in 1950 with a more stylized bear head. In 1972, Steiff retired the bear head chest tag, but they continue to use the bear head art on their packaging materials. Every time we see that friendly face, it stirs fond memories, truly a testament to how timeless good design can be. It's easy to see the inspiration behind our adorable Teddy! For over a century, the purity and charm of Steiff's Classic bear remain strong and cherished by generations. Our Teddy Companion is based on the beloved 1920s Steiff Bear design - from the decade when the first bear head chest tag was used! 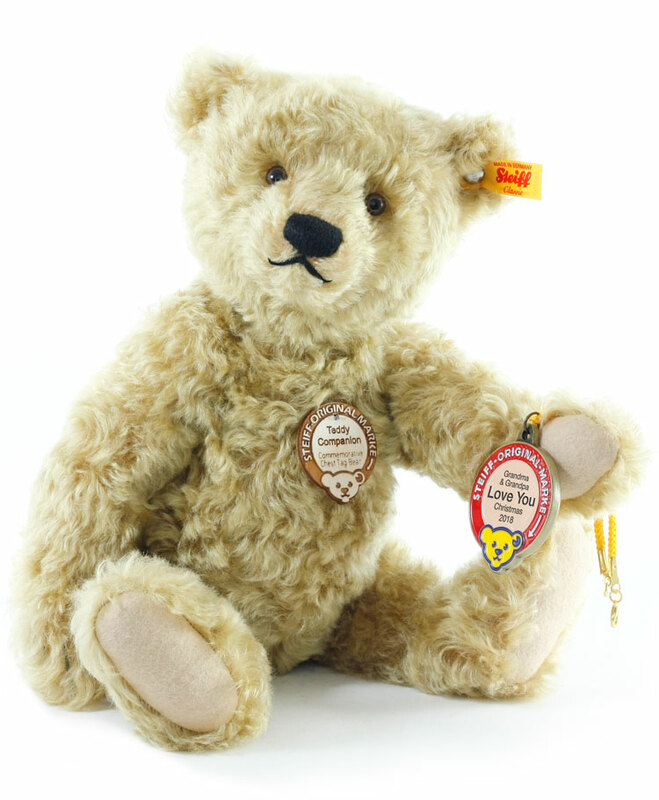 What better Steiff bear to wear your personalized medallion? Teddy's beautifully crafted metal medallion replicates the 1950s version of the Steiff bear head chest tag and will be custom personalized just for you. Using a fine laser process guarantees that not only is each medallion's engraving perfect, but also permanent. Our customers share many touching stories with Teddy & their personalized medallion! The history of your Steiff Teddy begins with YOU! 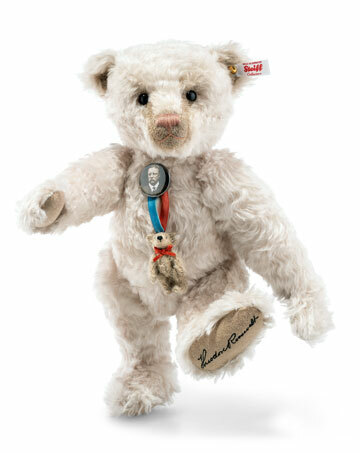 Just think... your Steiff Teddy will commemorate your history and heritage with your own personalized message. Not only will you receive this gorgeous limited edition Steiff Teddy... he will be truly unique to you! Instructions to personalize your medallion:Add your personalized message to the COMMENT box when you checkout. You can have up to 4 lines, limited to about 20 letters/numbers/spaces per line. Note: the more letters used, the smaller the type will be. Need help? Contact us with help on your personalized message. How long will it take? Please allow approximately 4 weeks to personalize your medallion. Click here to download a PDF form to help you personalize the medallion. 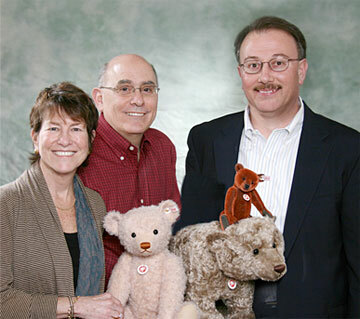 Growing up, a Steiff Teddy became our best friend. He consoled us, comforted us and made us feel loved and safe with each and every hug. For over half a century, the iconic Steiff paper chest tag was a feature of every Steiff animal. 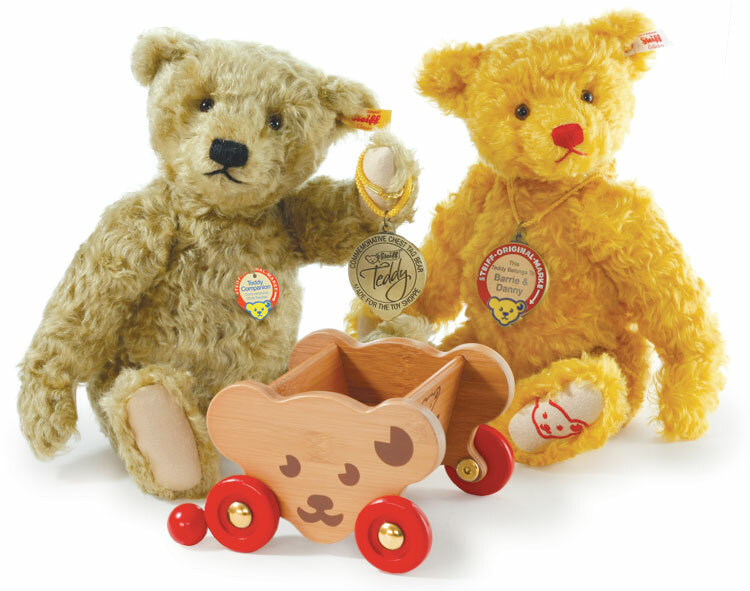 With its brilliant red circle and bright, golden-yellow bear head, this tag symbolized the magic of Steiff.